Home kimi_raikkonen personal life WDC Kimi Räikkönen's, 29, grandmother Sirkka Pietilä passed away last week at the age of 83. WDC Kimi Räikkönen's, 29, grandmother Sirkka Pietilä passed away last week at the age of 83. Kimi Räikkönen lost his grandmother Sirkka Pietilä last week. We are now publishing our interview with Sirkka from 2007 - Kimi had just won the WDC. Seiska published an interview in 2007 with the joyful lady and her affectionate photo albums from the years. Here is the whole interview and selected photos from Sirkka's album. World Champion Kimi Räikkönen's grandma Sirkka Pietilä opened the door for two reporters from Seiska on Monday noon. – Goodness gracious, I still haven't slept at all, Sirkka sighed looking completely awake. - I just made coffee but forgot to eat the sandwich. I'm still dizzy about Kimi's victory. Sirkka had been cheering for Kimi with her friends in her home in Helsinki. – We emptied a champagne bottle when celebrating the victory. I had in store a bottle of cognac but there it still is on the table, untouched. The phone has been constantly ringing and there has been many congratulators. – There were two young reporter-boys here in the evening. I was so happy that I kissed them too, Sirkka tells. During the GP Sirkka played cards with her friend at the dinner table. – When Kimi then won, I called my daughter Paula (in the picture below) but we didn't get one sane word out of our mouth. We just screamed. Sirkka tells that she hasn't seen her grand child much lately. – Our naughty boy doesn't have much time to call grandma but it's completely understandable. I met Kimi in the summer when Ferrari invited me to Nürnberg's GP to the holiest of the holy, Sirkka tells and shows her precious photograph memories from the Ferrari garage. –They treated us like royalty. We had our own chaffeurs and guides. On the table there's a valuable item, an old Ferrari-mug that Sirkka got as a gift from a rally star. The iron grandma would have been willing to go more often to GP's, she went crazy over Ferrari's hospitality. – I wouldn't have anything more than time but the money is tight. The F1 is so expensive, Sirkka says with a grin. – I love the color red. If Ferrari would invite me I could go as their mascot. Sirkka remembers Kimi's and his older brother's childhood. Back then grandma used to actively follow the brothers hobbies. – Kimi (left in the picture) was more active than his brother. The boy showed his sportsman's character at an early stage. I stood many times cheering for the boys when they played icehockey. Sirkka didn't anticipate at that time that 20 years later the blonde blue eye would get the most glorious tropphy of the whole world of speed. 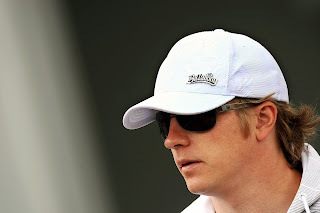 – You couldn't tell from Kimi when he was a child that he would chose racing for his living. I believed more that he would be an icehockey-player. Kimi went crazy with driving vehicles as 3 years old just like his 2 years older brother Rami did. Karting became such a beloved hobby that their father Matti funded the expensive hobby by doing three jobs.